A cadenza is a parenthetical flourish in a classical or jazz composition in which a virtuoso solo passage is inserted into the work, typically near the end. While a cadenza is composed to showcase the virtuosity of the performer it is also written with space for the soloist to improvise and embellish the composition. Parade the Circle is a day of cadenzas. 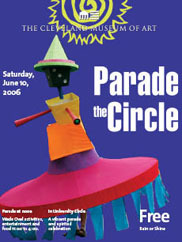 Each parade ensemble has been handcrafted over many weeks by individuals, families, schools, and community groups for their moment to shine around the parade route. 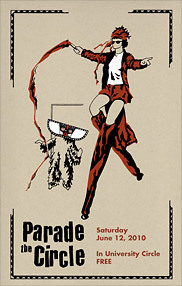 In essence, each float, giant puppet, stilt dancer, costumed performer, and musician is a personal cadenza within the whole of Parade. Collage, from the French coller, “to glue”, entered the art terminology lexicon in 1912 when it was coined by both Georges Braque and Pablo Picasso. Certainly the techniques of collage go back to the invention of paper in 200 BC but most examples begin in 10th century Japan when calligraphers began applying their poems on paper to scrolls, soon followed by the application of gold leaf to illuminated manuscripts in medieval Europe. With Picasso and Braque collage went beyond a technique; it became a concept, which revolutionized cubism, taking it from analytic to synthetic, building up a form from small sections instead of breaking it down. 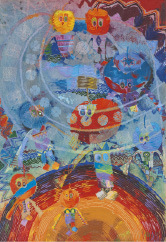 Initially considered a lesser art form, collage soon revolutionized modern art. It became an approach to making art. 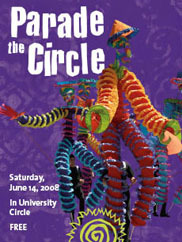 For me, Parade the Circle, is an example of kinetic collage, an assemblage of human beings interacting with each other, augmented by sets and costumes. Through the use of an optional theme, the artistic creations that make up Parade, share exposure to a common idea, which whether incorporated or not, allows these creative impulses to compose an idiosyncratic narrative. 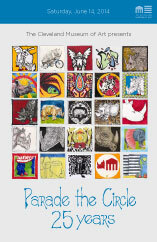 This year as we celebrate 100 years of the Cleveland Museum of Art we can marvel at our museum that so fervently celebrates the opportunity for self-expression for all individuals, and provides the protective rectangle to bind this sacred circle of creativity we know as Parade the Circle. BEAT! To beat. To breathe. To create. Our initial interest was in the word animal and then the word animate. Assuming they must share the same Latin root, we were curious to know what it was. 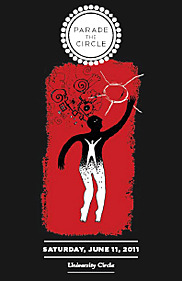 Both come from anima meaning “spirit, soul, breath, or mind.” The original definition of animate is “to bring to life” or “to create.” Following the thread of roots we looked up the word spirit, discovering its roots are virtually the same, spiritus (breath) and spirare (to breathe). Our discussions of these overlapping meanings led to the question, what is behind the breath, what is our driving force? Our answer was the beat, the engine for our being. We felt this single word exemplified the shared energy among all living beings, human, or other animal. In this 25th anniversary year of the Americans with Disabilities Act, we celebrate the many varied ways to animate, to create, to live. In 1990 Recology San Francisco began an artist-in-residence program to instill a greater appreciation for art and the environment in children and adults. In 1984 designer Thomas Meyer envisioned a new style of personalized artful clothing and he named it Desigual/It's not the same. In 1990 this Ibiza based company began to think global. 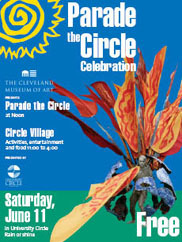 In 1990 the Cleveland Museum of Art launched the first Parade the Circle, initiating a program of community engagement and interactive community art-making with a commitment to unparalleled artistic excellence. 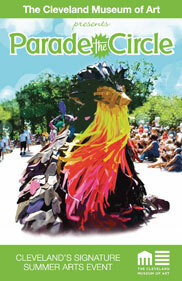 Inspiring creativity, individuality, global awareness, and community spirit. Throughout time humans have been looking around and appropriating both raw materials and "ready mades" to help create the world they want to live in. Enterprising individuals in contemporary times weave plastic grocery bags into rugs and sew juice boxes into market bags. We are no longer surprised when artists turn discarded items into sculpture or utilize newspaper print and magazine imagery in collages. More surprising is how far back in art history artists have found creative inspiration from unlikely sources. An annotated guide introduced works in the CMA collection that illuminate this practice. A sense of place—an artist’s response to a familiar landscape or an exotic new locale—is a recurring theme throughout art history and in the galleries of the Cleveland Museum of Art. 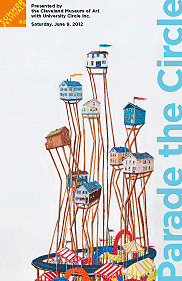 As Greater Clevelanders, we are acutely aware of changes in our communities. Even decline becomes an opportunity for rebirth. As plants, and organizations too, branch out, the branches themselves sometimes grow roots, becoming self-sustaining in a new environment while maintaining ties to their original source. In this way we support ourselves and each other and enable our community to flourish. Twenty-first-century artists create from within a global village. Whether we travel physically or connect electronically, our environment has expanded, allowing us to experience cultures, customs, and traditions that we previously could only imagine. Each new encounter may amaze us, challenge us, and stimulate us to respond with our own song. The Cleveland Museum of Art stands as a metaphor for this wider world. Each gallery offers new cultures, new techniques, and new points of view to inspire us. In spring 2011 we will have opportunities to enjoy South African art from the past century in the museum’s east wing and to meet contemporary South African artists. 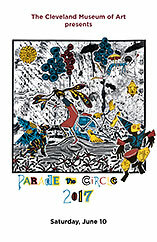 Parade the Circle will welcome three artists from Les Grandes Personnes d’Afrique of Johannesburg, South Africa, who will work in tandem with two artists from the parent company Les Grandes Personnes of Aubervilliers, France. We invite you to add your voice to this artistic chorus. A door, a portal, a port—a marker of coming and going, welcoming and saying good-bye. A beginning of sharing culture and tradition, creativity and innovation. In late June 2010, the Cleveland Museum of Art opens its newest door, unveiling reinstalled galleries on the lower level of the original 1916 building. These galleries showcase the museum’s collections of the ancient art of Egypt, the Near East, Greece, and Rome; the arts of late antiquity, the Byzantine Empire, and the European Middle Ages; as well as the collection of African art. The art objects in these collections were once integral to living cultures, and many were used actively in daily life, ceremonies, rituals, and festivals. 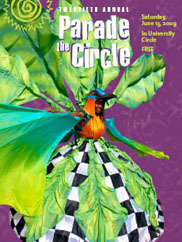 What a perfect opportunity for Parade the Circle, a Cleveland tradition of ritual and celebration, to recognize this portal of cultural exchange. African mask makers, musicians, and dancers from Burkina Faso will share the living traditions of the Bwa people with Cleveland and enliven Parade 2010. 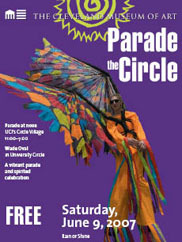 The 20th Parade the Circle precedes by two weeks the public opening of the museum's East Wing. 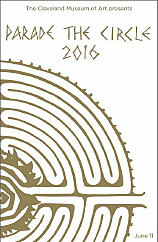 This year's Parade theme highlights both the exterior and the collections of the East Wing. One of the most evocative terms in the art lexicon, chiaroscuro illuminates the myriad ways artists render contrasts of light and shadow in a creative work. Whether exploring light and shadow, the interplay of dissimilar elements or what exists in partial shadow, within chiaroscuro lies the penumbra, the area between light and shadow. In literature or art the penumbra also refers to that which cannot be defined as either real or fantasy; it is the area where dreams, daydreams, our muses and inspirations reside. One of the most difficult challenges an artist faces is to draw out the essence of an inspiration and develop it into a sculpture, painting, poem, dance or parade ensemble. Each creative individual must "beguile the penumbra" in their own unique way. As the Cleveland Museum of Art prepared to open its new East Wing galleries, the chiaroscuro of the East Wing's exterior, its dark and light stripes, led us to the penumbra within, and helped us mine these artistic treasures for inspiration. As we realized our personal artistic visions, we shared them with all Greater Clevelanders in the 20th annual Parade the Circle. The creative process begins with the Muse, the vision, frequently something on the periphery of our conscious awareness; then comes the fiddling with the idea, sifting its many parts like grains of sand, arranging them until everything finds its proper relationship and weight; finally committed to the statement, the artist "runs with it,” putting paint to canvas. With its renovation and expansion project, the museum, literally “temple of the muses,” followed this same process. Now with the vision and the deliberating essentially complete, the commitment has been made, the skipping has picked up steam, and the running is underway. In Catalonia, Spain, two components form the Catalan personality: seny, an instinctive and reliable sense of order, couples with rauxa, an ebullient spirit and love of almost excessive gaiety and frivolity both in life and in the arts. These complementary elements formed the basis for Modernism, the art movement centered in Barcelona, which brought us Gaudí as well as Dalí, Miro, and Picasso. The Cleveland Museum of Art reopened with the special exhibition Barcelona & Modernity, October 15, 2006-January 7, 2007. The pimply faced boy is wearing the crown. It sounds like a verb, but it's really a noun. Only the mystic is wearing a gown. It feels like it's pink, but is actually brown.